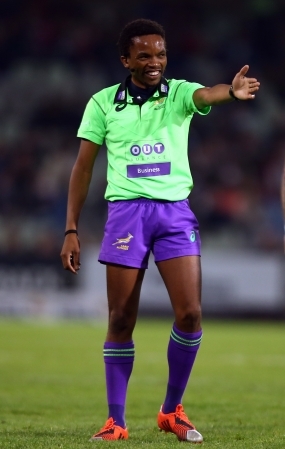 Rasta Rasivhenge of South Africa referees the first match and the last match of the Sevens at the Waikato Stadium in Hamilton, New Zealand. And when he referees that last match, between Argentina and New Zealand, it will his 250th match on World Rugby's Sevens Series. That is more than any other referee has refereed. When he refereed his 237 match, Rasivhenge passed the record held by Anthony Moyes of Australia. In the series, Rasivhenge has refereed 19 finals. In his stellar career, which has made him the most recognisable referee on the Sevens circuit, he has refereed the World Cup Sevens final in 2013 and the Olympic Games Sevens final in 2016, the year he was the joint referee of the year with Alhambra Nievas if Spain who refereed the women's Sevens final at the Games. There is still a lot left in Rasivhenge's rapid legs. Referees for the Hamilton Sevens: James Doleman (New Zealand), Craig Evans (Wales), Sam Grove-White (Scotland), Richard Kelly (New Zealand), Damon Murphy (Australia), Rasta Rasivhenge (South Africa), Matt Rodden (Hong Kong), Tevita Rokovereni (Fiji), Jordan Way (Australia). In addition Craig Joubert, who is now employed by World Rugby to help with the development of Sevens referees, also referees matches, which is good for those matches.